Florida is suffering from a bottleneck of voters ahead of Election Day, with some waiting up to nine hours to cast their ballots. On Saturday – the last day of early voting – residents there were either forced to wait in long lines for up to nine hours or turned away from the polls altogether. Despite the ordeal, Florida Gov. Rick Scott said he would not be extending the early voting hours. Also in Florida, some voters reported receiving fake letters that claimed their citizenship status was being questioned. “The Sarasota County of Elections has received information from the Florida Division of Elections regarding your citizenship status, bringing into question your eligibility as a registered voter,” reads the letter signed by Sarasota County Supervisor of Elections Kathy Dent. Kathy Dent said the letter is fake and that her signature was forged. Most of the letters appeared to be targeting Republicans, according to election officials. The Florida situation was just one case of voting irregularities popping up in key swing states where people have already begun casting their ballots, drawing concern among both Democrats and Republicans that their opponent’s party could be trying to illegally sway the election. Reported voting problems include claims of faulty polling machines, late-arriving absentee ballots, voter intimidation, forged absentee applications and lengthy lines outside polling locations. 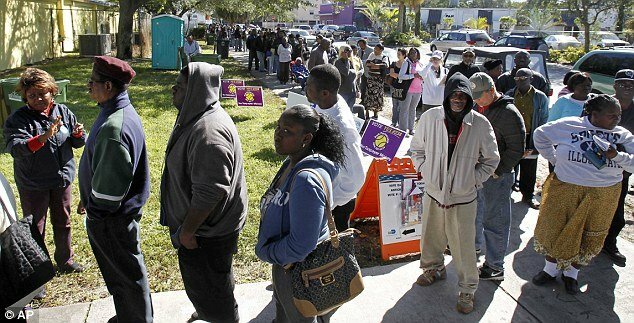 Democrats say the long lines outside early voting sites, some of which kept people waiting at least eight hours before they could cast a ballot, are effectively suppressing voter turnout in areas highly populated by minorities. The period for early voting in Florida is shorter than it was in 2008. Meanwhile in New Hampshire, another battleground state, a few out-of-state voters have complained that their absentee ballots haven’t yet arrived in the mail. Some voters have discovered that their ballots were lost in the mail, while others are still waiting for them to arrive. New Hampshire voter Pamela Keilig didn’t find out until last week that her application for an absentee ballot was lost in the mail. She is now planning to make the 75-minute drive across state lines to cast her vote on Tuesday, according to ABC News. While some in the Granite state anxiously await the arrival of their ballots in the mail, many Iowa voters have received out-of-state voting ballots that they never requested. Recipients of unwanted mail notified the state and the Iowa Division of Criminal Investigation pulled the applications for the ballots to find out where they originated. Investigators discovered that the signatures on the applications had been forge and the state is still investigating the matter. Absentee ballots have also caused some problems in Ohio, where many voters failed to put enough postage on their ballots before returning them to the state. Some of the ballots were thicker than others, due to additional ballot questions concerning local issues in some counties, and required more than the standard 45-cent stamps. U.S. Postal Service spokeswoman Patricia Licata said with or without the right postage, the ballots will be mailed, however. Outside of the potential for human error in the voting process, election officials are also concerned about the possibility of technological glitches. Republicans, in particular, are concerned about voting machines in six states, including the hotly contested states of Ohio and Colorado. The Republican National Committee wrote a letter to election officials claiming that voters have reported that some machines were switching their votes for Mitt Romney to votes for President Barack Obama. RNC spokesman Tim Miller said a “few dozen” people had run into machine problems and he didn’t accuse anyone of wrongdoing. Democrats, on the other hand, are pointing fingers at Republicans and accusing them of trying to suppress minority turnout at the polls. Robert Bauer, general counsel for the Obama campaign, issued a memo Friday that linked Mitt Romney’s campaign to efforts to send people to polling centers to challenge voter eligibility. Democrats are also upset over Spanish-language billboard ads in Pennsylvania that instructed voters to show ID at the polls, even though that won’t be required in the upcoming election.